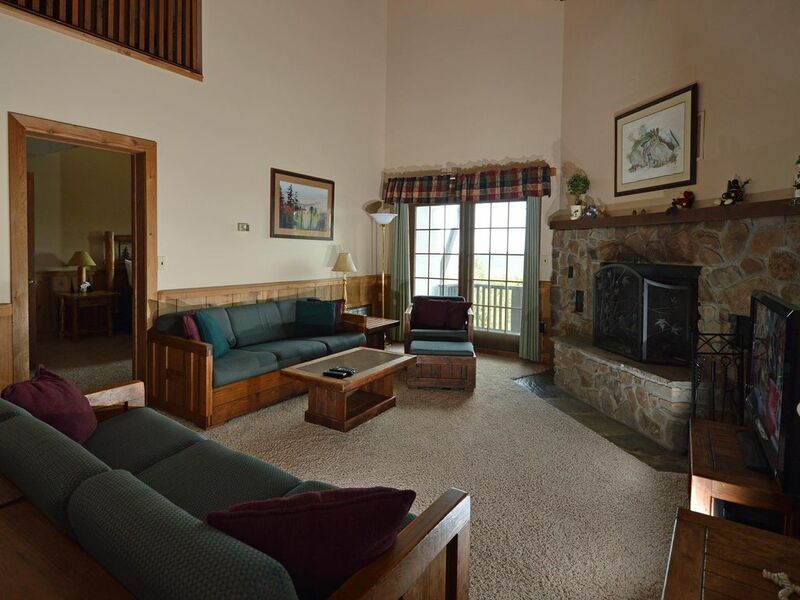 3 BEDROOMS, 3 FULL BATHS: Ski In / Ski Out. Bedroom # 3: Two Queen Beds, TV/DVD. PLUS: Ski Storage Entry. Deck overlooks the trails. Free WiFi. Free Long Distance. AMENITIES: Lots of ski/snowboard artwork, rustic decor, and personal touches. Master Bedroom aspen log furniture custom made by an Idaho craftsman. Washer/Dryer. Arrive to top quality linens, lots of towels, paper goods, soaps, detergents. Complimentary full bag of STARBUCKS Coffee for you. Popcorn for the kids. LOCATION: Superb Top Floor Corner location fronts directly on Whistlepunk Trail, a Novice run connecting to the entire trail system. 2 ski lifts within 75 yards. Across the street from the Double Black Diamond trails of fabled Western Territory. A 5 minute walk north of the center of Snowshoe Village, Split Rock Pools and our favorite restaurant, The Foxfire Grill. ENJOY: A true ski lodge experience. Vaulted ceilings, mountain chalet charm. All 27 kitchen cabinet knobs are different, hand crafted with bear, moose, and rabbits-See if the kids can find them all. Park on one side, ski on the other. Perfect for 2 couples and a bunch of kids, or one large family. Mountain decor and upgrades by a caring owner. Convenient and Fun - Whistlepunk One. Cozy & close to the slopes...what more could you ask for? Had a wonderful stay! We had four couples and it worked out perfectly! The ski in - ski out is awesome. We wouldn't hesitate to go back again! Thanks!